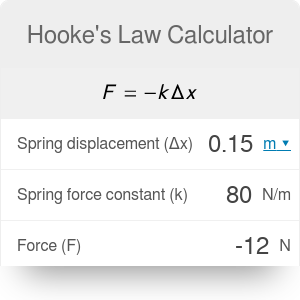 We created the Hooke's law calculator (spring force calculator) to aid you in determining the force in any spring that is stretched or compressed. You can also use it as a spring constant calculator, if you already know the force. Read on to get a better understanding the relationship between these values and to learn the spring force equation. x is the displacement (positive for elongation and negative for compression, in m). Where did the minus come from? Imagine that you pull a string to your right, making it stretch. A force arises in the spring, but where does it want the spring to go? To the right? If it were so, the spring would elongate to infinity. The force resists the displacement and has a direction opposite to it, hence the minus sign. You can find the elastic potential energy of the spring, too. Choose a value of spring constant - for example 80 N/m. Determine the displacement of the spring - let's say, 0.15 m.
Substitute them into the formula: F = -k*x = -80*0.15 = 12 N.
Check the units! N/m * m = N.
You can also use the Hooke's law calculator in advanced mode, inserting the initial and final length of the spring instead of the displacement. You can now calculate the acceleration that the spring has when coming back to its original shape. Hooke's Law Calculator can be embedded on your website to enrich the content you wrote and make it easier for your visitors to understand your message.